Kibuye, Rwanda might be the prettiest town in the whole country. Built into a series of hills surrounding lake Kivu, it is extraordinarily beautiful. It is a bit of a resort town for more well off tourists, but there is a guest house on the other side of town, take the road down the right as you leave the bus station and reach the fork. Walk down until there is a shopping center to your right, across the road there is a guest house for an affordable guest house. I’ve forgotten the name, but here it is on Google Maps. And then you can go here for food. It’s a small buffet style restaurant where you can get lunch for about a dollar. It’s a local place so it’s all Rwandan food, lots of rice, potatoes, and matoke. Kibuye doesn’t offer much in the way of attractions, just lovely hiking through the mountains and swimming in lake Kivu. There’s also a small genocide memorial in front of the church. 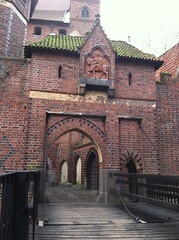 So instead of wasting more time, here are a few pictures. This entry was posted in Rwanda and tagged hiking, nature, photos, swimming on September 4, 2012 by patwelz. With the construction of the Owens Fall Dam (also known as Nalubaale) in the mid 1950’s and the Bujugali Dam finished in late 2011, Rippon Falls, Owens Falls, and Bujugali Falls have all been submerged in order to provide steady hydroelectric power for Uganda. These were all world class rapids that are now completely underwater. Luckily there still is one place available for top notch white water viewing and rafting. 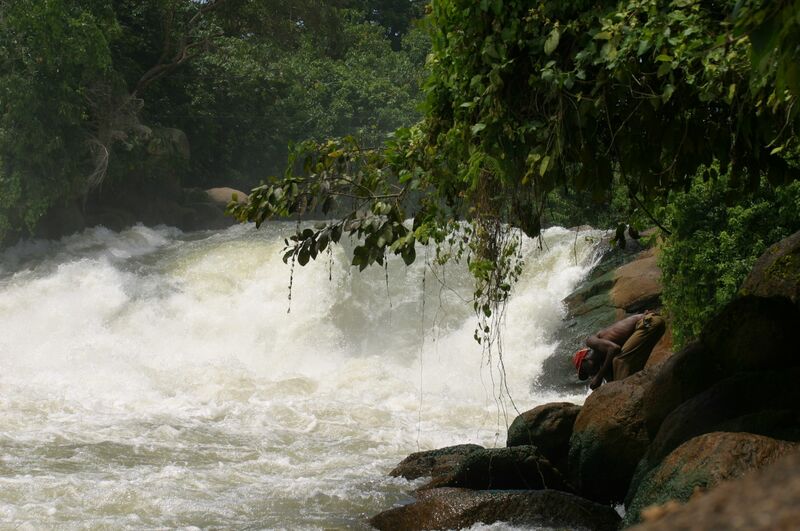 Approximately forty minutes north of Jinja by matatu is Kangulumira, a mere three kilometers from Kalagala falls. Kalagala is another one of the easy day trips to make out of Jinja. Simply visit the bus park, ask for the Kangulumira minibus, and hop off at the bus stage where the driver stops for you. There is a sign for a whitewater company pointing down the road through town. Hike down the road for about an hour or hire a boda and you’ll be right there. Alternatively you can take a fancy ride with one of the adventure companies in Jinja if you have more money than sense. One of the best parts of Kalagala is the price. It’s free. Upon first arrival in the area there is a big rock you can climb on to view the falls. More of a big rapid than a proper waterfall, Kalagala Falls is probably only seven or so meters tall at the highest point. But it is still an intense place to see all the water rushing past. You can climb right down to the edge of the water and very close to the falls with the available paths, but be warned the hill can often be slippery and the rocks near the water are always slick. If you lose your balance and fall into the raging whitewater you’re in for a world of hurt. Aside from the falls proper there are a couple of nice rapids to view but the hidden gem is a small swimming area quite off the beaten path. Kalagala doesn’t get many visitors anyway so you’re almost guaranteed some privacy. To find this area you follow the road you walked in on until you see a big gate for the whitewater company whose sign you saw in Kangulumira. Then promptly turn back around and less than twenty meters from the gate as you walk back there will be a small trail cut into the vegetation on your right. It is a little difficult to notice the first time but when you find it and walk down you’ll emerge with a view of some rocks and rapids directly in front of you and a placid looking Nile to the left. On the left you can climb into the water if you’re so inclined although be warned, the water current is much stronger than it looks. Stick close to the rocks and the shore line to avoid the strongest bits and have something to grab in case you lose it. If you try swimming against the current you’ll understand how powerful the river actually is. It looks like it’s doing nothing, but I tried to swim against the current and literally could not move forward. Swimming further out from the edges could be disastrous. Kalagala is very much worth the day trip from Jinja. Pack a small lunch and water. Even though it is a bit of a new tourist spot with the whitewater companies running their launches from the area, there are no shops near the falls to get anything and it can be a long, hot, sunny walk from Kangulumira. You’ve been warned twice but a third time won’t hurt. The current is strong and the rapids are dangerous. Think of how comfortable you are in the water and then play around at half that level to stay safe. Since the Bujugali dam was built so recently, the tourism development around Kalagala is non-existent so don’t make any plans to stay overnight in the area. For less than five dollars round trip just take a minibus up in the morning and return in the afternoon. One last time, don’t do anything stupid in the water. You might see locals swimming through the rapids, that doesn’t mean you’re able to. They’ve been doing it their entire lives. This entry was posted in Uganda and tagged hiking, nature, swimming, whitewater on July 6, 2012 by patwelz.